Originally Submitted to FurAffinity.net on September 11th, 2011 12:01 AM. Before it was transferred to Inkbunny it had 355 views and 176 favorites. Expressing yourself can be difficult, but this Ethiopian Wolf has found an outlet through tagging. 36-24-36, she got the winning hand! 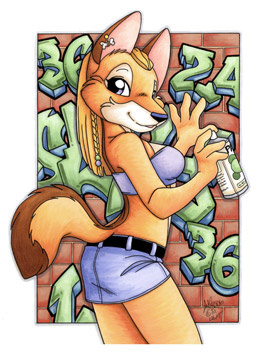 I'm posting some of my pre-FA artwork for your enjoyment, this was drawn in 2006.